A step-by-step guide to file Form 8283 Non-cash Charitable Contributions. Americans must be a generous people. Around $300 billion go to charity every year and the IRS even allows for tax deduction for whatever you donated. The only question now is, just how generous were you? If your donation amounts to at least $500 you are eligible to file Form 8283 (non-cash charitable contributions form). It’s really easy to go through it, so why don’t we begin? Section A is for donated property that amounts to $5,000 or less (if we’re talking about stock, the value can be higher than $5,000). You begin on Line 1 by saying who you are and describe the donated property. Enter your cost, the fair market value of the property and describe how you calculated this value. The IRS wants to be sure that you evaluate your donations in a fair manner. 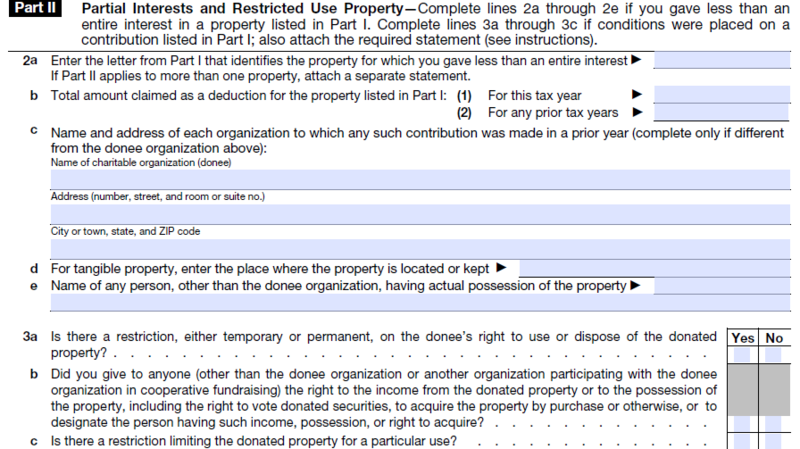 If you donated only part of a property (and not the whole property) go to Line 2. Identify the property on Line 2a and enter the amount that you claimed as a deduction for this property on Line 2b (for any year, not just the previous one). On Line 2c, you have to identify the beneficiary of the donation. If we’re talking about tangible property, write the place where the property is located on Line 2d. If a person other than the beneficiary has actual possession of the property, include the name of that person on Line 2e. If you included any conditions or restrictions when you made the donation, you have to provide details on Line 3. 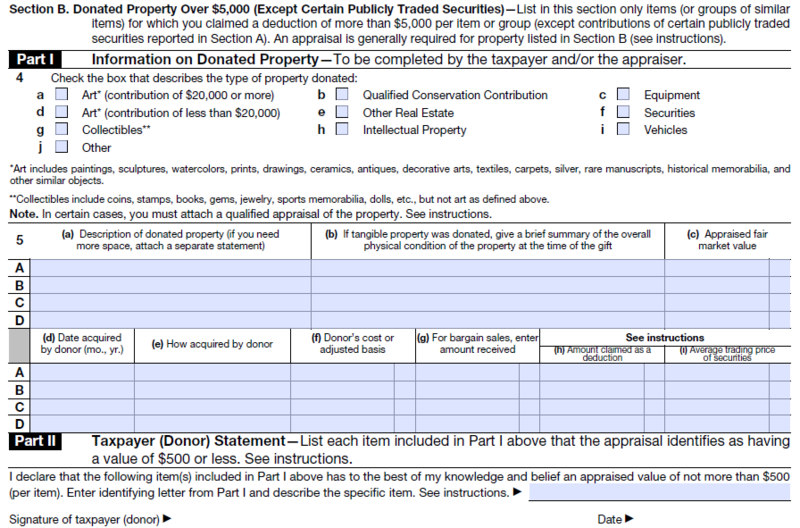 Let’s move on to Section B, the part where the donated property is valued over $5,000. Enter the type of the property on Line 4. Keep in mind that “Art” is a very broad term. It includes furniture, drawings, prints, sculptures, ceramics, carpets and other similar things. If the total value goes over $20,000 you’ll have to include a qualified appraisal of the property. Line 5 is like Line 1, with very little changes. On Line 5b you have to detail the physical state of the donation and on Line 5 you should say if the property was considered a bargain. On Line 5h include the amount that you claimed as deduction. Don’t forget to finish by signing and dating the document. 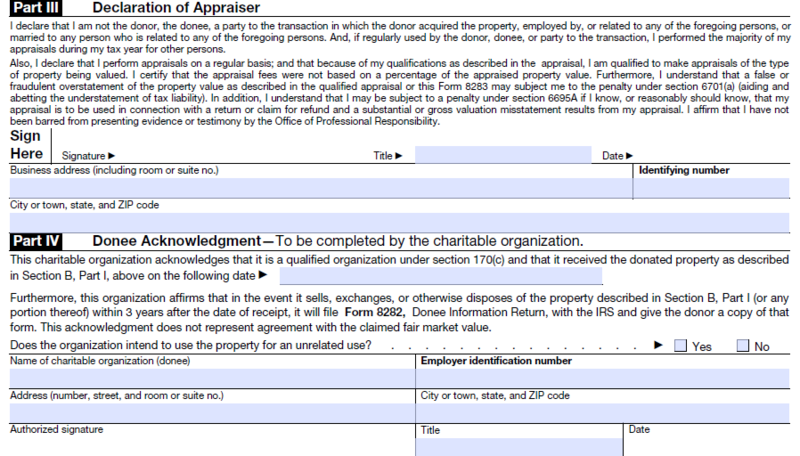 Next, just take your appraiser’s data and file it in Part 3, while the information on the charitable organization goes in Part 4. That’s all. Charity is a good thing and it can get even better. Just make sure to keep your records in order and take a few minutes to file this form. Some of the generosity you showed to others will come back to you as deductions. It’s really easy indeed.